Lake Oswego 206, Oswego Lake, scenic. 105% [postmark]: Oswego Oregon, Aug 28 pm, 1911[?]. [addressed to]: Mrs. Etta Magone, St. John, Oregon. [message]: Dear Sis Ett. I wish you many happy returns of this your birthday. 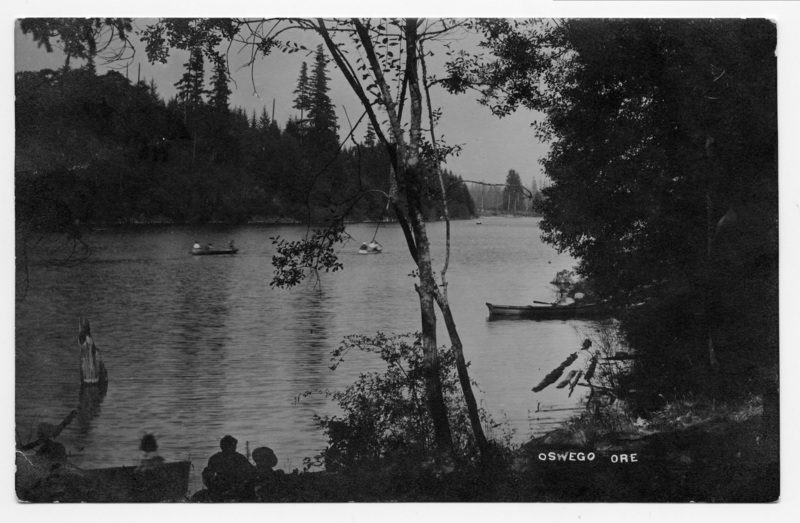 I think this is a scene on Oswego Lake. I got it Friday. Have you returned from Claras. We still have some berries, they have lasted three months. I have picked 700 boxes. Come and see us. With love Sis Mary. Description Postcard from Mary Lucretia Carman Wilmot to her sister Henrietta Susanna (sp?) Carman Magone. [imprinted on front]: Oswego Ore. Transcription Lake Oswego 206, Oswego Lake, scenic. 105% [postmark]: Oswego Oregon, Aug 28 pm, 1911[?]. [addressed to]: Mrs. Etta Magone, St. John, Oregon. [message]: Dear Sis Ett. I wish you many happy returns of this your birthday. I think this is a scene on Oswego Lake. I got it Friday. Have you returned from Claras. We still have some berries, they have lasted three months. I have picked 700 boxes. Come and see us. With love Sis Mary.